Daniel's prayer is a tremendous guide for our prayers in our daily lives. In Daniel 9, Daniel prays a collective prayer for nation of Israel that was captured by the Babylonian empire in 605 BC (see timeline). The Babylonian empire falls to the Persian/Mede Empire in 539 BC. King Cyrus, in 538 BC issues a decree allowing the Jews to return to their homeland and the temple reconstruction in Jerusalem begins in approximately 536 BC. Opposing forces stop the reconstruction in 522 BC. The Persian King at that time is Darius, and it is during this time frame, that Daniel prays this prayer (Daniel 9:1-19). And I set my face unto the Lord God, to seek by prayer and supplications, with fasting, and sackcloth, and ashes (Daniel 9:3). .... God opposes the proud but gives grace to the humble (James 4:6 ESV). 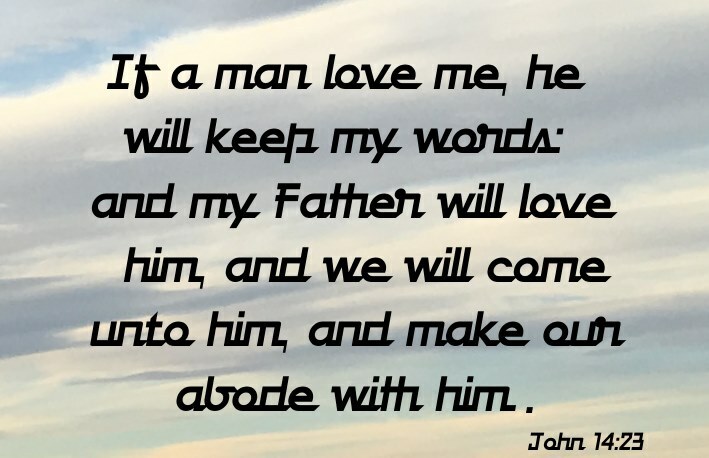 He then acknowledges who his God is and that God's covenant and mercy is extended to those that love Him and to those that obey His word. And I prayed unto the Lord my God, and made my confession, and said, O Lord, the great and dreadful God, keeping the covenant and mercy to them that love him, and to them that keep his commandments (Daniel 9:4). And forgive us our sins; for we also forgive every one that is indebted to us ..... (Luke 11.4). As you see, Jesus imposed a higher standard on forgiveness of our sins in the church dispensation. We need to forgive those who sin against us before He forgives us for our sins. Now therefore, O our God, hear the prayer of thy servant, and his supplications, and cause thy face to shine upon thy sanctuary that is desolate, for the Lord's sake. O my God, incline thine ear, and hear; open thine eyes, and behold our desolations, and the city which is called by thy name: for we do not present our supplications before thee for our righteousness, but for thy great mercies (Daniel 9:17-18). As it is written, There is none righteous, no, not one: (Romans 3:10). For all have sinned, and come short of the glory of God; (Romans 3:23). But what things were gain to me, those I counted loss for Christ. Yea doubtless, and I count all things but loss for the excellency of the knowledge of Christ Jesus my Lord: for whom I have suffered the loss of all things, and do count them but dung, that I may win Christ, And be found in him, not having mine own righteousness, which is of the law, but that which is through the faith of Christ, the righteousness which is of God by faith: That I may know him, and the power of his resurrection, and the fellowship of his sufferings, being made conformable unto his death; If by any means I might attain unto the resurrection of the dead (Philippians 3:7-11). 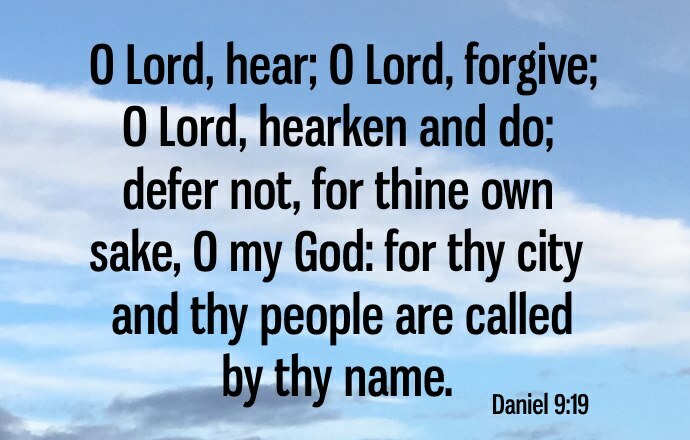 O Lord, hear; O Lord, forgive; O Lord, hearken and do; defer not, for thine own sake, O my God: for thy city and thy people are called by thy name (Daniel 9:19). O Lord, hear us. O Lord, forgive us. O Lord listen and act on our behalf! For your own sake, do not defer our prayer. O God, in the name of Jesus Christ, we pray for your people and your city. Yea, whiles I was speaking in prayer, even the man Gabriel, whom I had seen in the vision at the beginning, being caused to fly swiftly, touched me about the time of the evening oblation (Daniel 9:21). Our prayers may not get answered with the imminence that Daniel's prayer was answered, but that should never be a hindrance to praying this prayer.